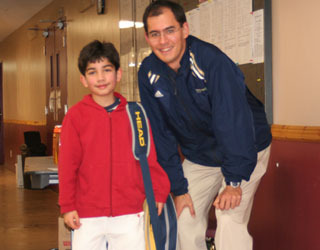 Joel Brobecker, above, a tournament referee explaining the rules to Sam Gouneili at the U12 Indoor Ranking Ladder competition held at the North Shore Tennis Club, Feb. 12 - Mar. 2, 2008. Joel job at junior tournaments is a demanding one. Not only does he liaise with young players; he also deals with their parents. There are sometimes lots of emotions involved both with players and parents. Junior tournament referees are responsible for a number of courts and move from one to another, standing at the net post for a full rotation of service games before moving on. They stay mentally alert - keeping track of the court they're presiding over and also the courts around them. They also work behind the scenes, helping organize tournament particulars such as the draw and order of play. They don't make us strongly aware of their presence, but the next time you spot them in a tournament, say "Hello."